I’ve tried many body lotion available in the market, but I chose NIVEA out of the rest. Maybe because I’ve grown with this brand and I’ve been used to its good quality and effects it gave me. I have to thank my first beauty influencer, my Mom for teaching me the chose the best…. Love you Mom! For past two months, this new NIVEA variant is been serving my body especially before bedtime, and I admit that am loving it. 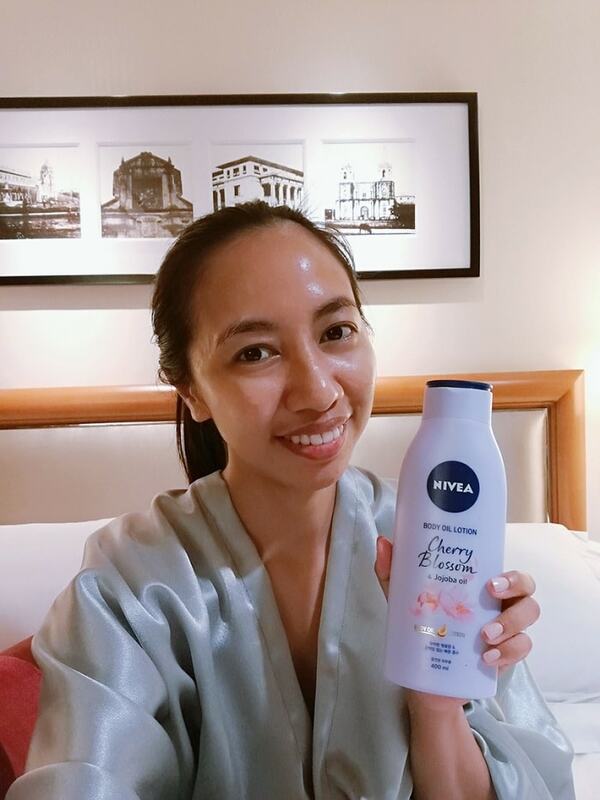 I was in my recent vacation weekend in Manila, when I stumbled this NIVEA Body Oil Lotion in Cherry Blossom + Jojoba Oil which on that time is on huge sale (but 1, take 1 baby) and I couldn’t help get more excited. You see, am a sucker for huge beauty discounts especially when I know that the product works well. So for many nights now, this new NIVEA body oil lotion is my companion. After warm bath, and finishing my face beauty routine, I applied this body oil lotion all over my body, from neck to toe. So what makes this different from other NIVEA body lotion and to other brands available? The fact that this is NIVEA’s first ever oil-infused body lotion makes a lot of difference. The one I’ve got had jojoba oil which is known as awesome skin moisturizer and also prevents skin irritations, or those scaly and rough patches. It is also rich with anti-oxidant which helps to soothe fine lines, minimize wrinkles, and naturally slow down other signs of aging. 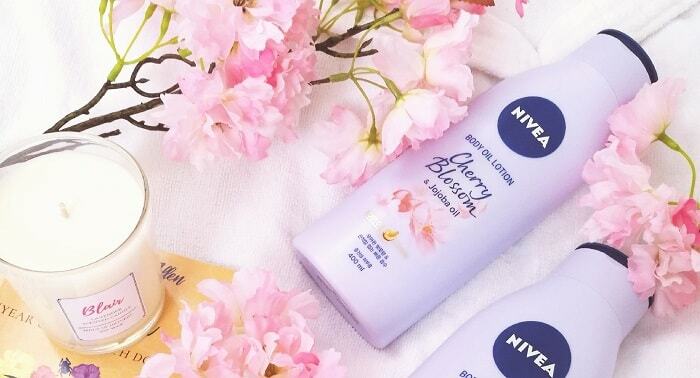 NIVEA also adds this cherry blossom because… well who doesn’t like this gorgeous, pinkish bloom right? Cherry blossom or sakura extracts has been used as soothing agent in skin care products, and adding it to the body oil lotion gives my skin a smoother effect. Its extracts also a reliable remedy for discoloration-prone skin, and also helps to brightens and evens the skin tone, such as my perfect tan complexion. 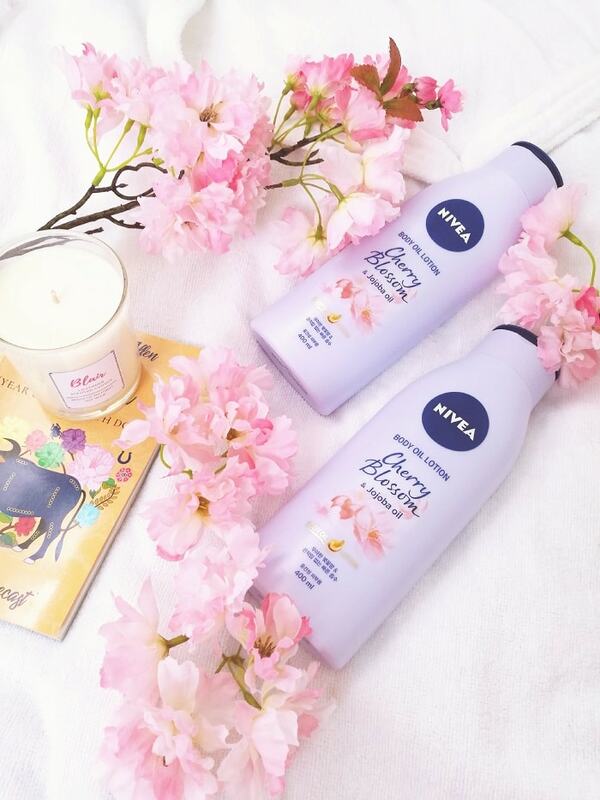 Also, cherry blossom is a symbol of beauty and youth, and extraordinary charm which I believe is perfect for every NIVEA women. I’ve bought mine at Watson’s store with Buy 1, Take 1 promo and I couldn’t be happier. I love applying this on my body before bedtime because it helps me to relaxed my skin, and have a good sleep. The next day, I’ve noticed how smooth my skin like a baby.. no wonder my Amore loves it. Also, this lotion have a very little mild, milky scent which is I like as well. My Amore said I smell like a baby! I will give a rate of 5-star for this NIVEA Body Oil Lotion. It is affordable and easily available. The lotion not sticky and easily absorbed to my skin. Packaging wise, it looks attractive and charming, plus it gives me an amazing smoother skin which I love most. Definitely, I will buy again and will try the rose + argan oil variant soon! Have you tried this new NIVEA Body Oil Lotion? Let us know your experience! Yeah, I've grown to like NIVEA coz my MOM used this as well. hahaaha thanks! There are many lotions that are also good for men. High five babe! I love it as well. My boyfriend sometimes us it too. I'm also using nivea product but i used the cream. Next time i will try this oil lotion. That classic cream is the best! Can be use in many ways :D I have that as well. I do use this. Like the smell so much. The scent helps me to get a good sleep. I love moisturisers because I have dry skin and need to replenish the oils after a bath. Nowadays I use oils instead of moisturisers. I find they work well for my skin. Body oil is awesome too, and absorbs easily. I use it after my bath. I think it was the rose variant, which I want to try as well, after I've finished this. I love the scent of this Nivea Cherry Blossom and I used it every night now and then! I enjoy using Nivea Body Lotion products! And I love that they are always in SALE! I guess the fragrance will be so nice by seeing the name itself. Yes it is Shini, try it babe! Both Cherry Blossom & Jojoba Oil are such nourishing materials. Good to know that the body lotion has both.